Have you tried Metro Bike Share? Have you heard about the program but not yet taken a ride? Do you even know what Metro Bike Share is? In any case, Metro wants to hear from you! Metro Bike share is conducting a survey to see how we are doing after the program’s first six months. 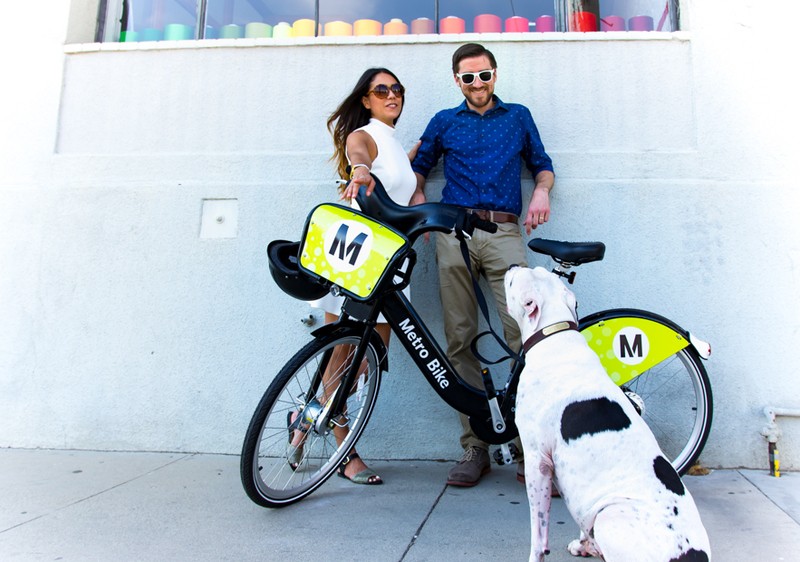 This survey will help inform how we can improve Metro Bike Share in DTLA and in future expansion communities, including Pasadena, the Port of Los Angeles and Venice, among others. Your responses will be kept confidential. Please share your opinions and experiences via this short survey — you can also enter for a chance to win a Metro Bike Share prize pack. Your chances to win the prize pack are approximately one in 300, and participation in the survey is not required in order to participate in the raffle. The Metro Bike Share prize pack consists of a T-shirt, a fanny pack and free Metro Bike Share rides for you and your friends. Take the survey here in English or Spanish by Monday, February 6. I did the survey but there is no place to leave comments. Bike Share should be priced the same as Bus and Rail and allow free transfers for 90 mins. I’d use it a lot more if I could hope off 7th and Metro and ride a few blocks. It’s not worth full price at the point. Can Metro please focus on communities that do not have it?? The system that Breeze Bike Share (and Long Beach and West Hollywood) uses is different (and incompatible) from that used by Metro. It does not require stations. ^^^^^ Huh?? You said venice has bikeshare->Its not all over or littered with bike stations like SM is. My use of bike share would be to COMBINE it, as in Multi-modal travel. let me continue a trip with a TAP card. It’s way too expensive to use it as one imagined – as a last mile so of thing. At the current prices. I’d love to occasionally ride EXPO downtown, and then cruise on over to a meeting – but not for the present price. I either ride all the way, bring my bike on the train, or usually drive. Sorry Metro, so far I haven’t seen any reason to use Metro Bike Share.